Greg Thomas recently asked me for some help to achieve his first chin-up. He wanted to add some additional training after class that wouldn't take him more than 15 minutes to complete. Here's a short video I made for Greg, explaining the program. This is an adaptation of Pavel Tsatsouline's 'Fighter Pull-Up Program', with nuance provided by the RPE scale and customized for the equipment available at DelVal. - Additional strength and tension could be provided by accentuating the 'negative' (eccentric) portion of the repetition. I wouldn't over-do this.. Maybe a 2 second descent? Count these reps as an 'upscale' from whatever setup you're currently using. - In 99% of cases, I recommend that folks do CHIN-UPS (palms facing you) vs. pull-ups. You'll get over the bar quicker with a chin-up. 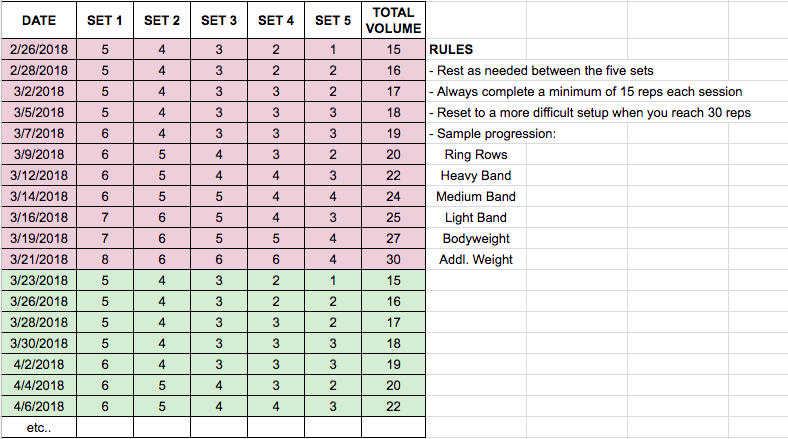 Here's the progression written out as sets and reps. The color difference indicates an athlete switching from one 'system' to another, eg. ring rows and then to banded chins.